So, some of you have been following my struggles with this on Instagram, but this is the first time the whole thing is being shown off, even if it still is many pieces. The light orange is my favorite, it's Soho solid in Citrus. The top four rows have been sewn into a partial top, because I only have room on my design wall for 7 rows. And I am aiming for eleven. So this is the rest. The top four are joined into rows, the next two are joined into blocks, and the last is still loose triangles. 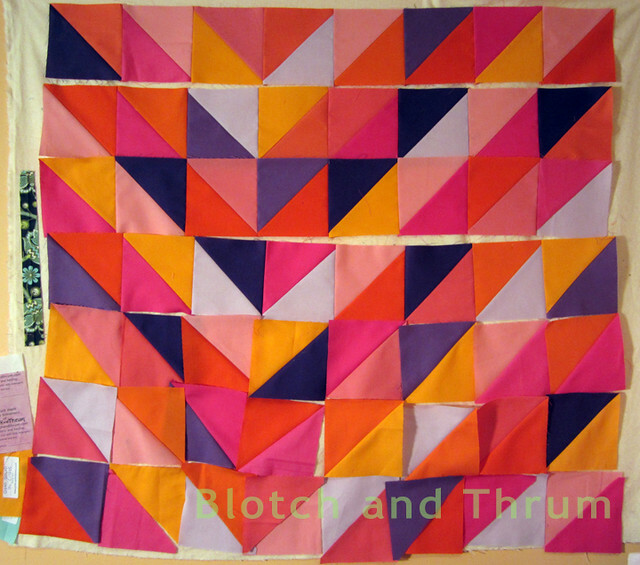 And then I have about just as many extra triangles as I have put into the quilt, because I get carried away when I cut fabric with my Big Shot. In response to this, my sister has helpfully informed me that she likes orange and pink, too. 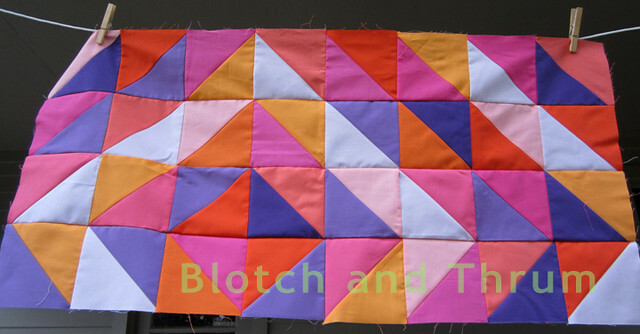 I'm hoping to finish it up, quilting and binding, too, before the Ann Arbor Modern Quilt Guild meeting next week. We'll see. Love love love love love your colour pallette. Thanks! It's based on the fabric that will be the backing, with a few additions to add "sparkle" as a more experienced quilter put it when she helped me chose fabrics. Initially, I was planning to use only 6 colors!